Parents everywhere are still making this fundamental cold-weather mistake. As parents, we all want our children to be both safe and warm. However, in practice, our desire to keep our kids warm is actually making them less safe. Why shouldn't my child wear a winter coat in the car? Simply put, it is near-impossible to have a seat belt fit correctly while wearing a winter coat - even for adults! When an accident occurs, our bodies are flung forward while our seat belts (as intended) remain tight. The problem winter coats present it that they compress under pressure - so in an accident, the coat compresses causing your seat belt (or your child's) to no longer fit tightly where it should. How do I know what coats are car-safe? Fleece is always a great choice as it doesn't allow for compression. If you are unsure, put the coat on the child and fasten them into their car seats with the straps as tight as they can comfortably be. 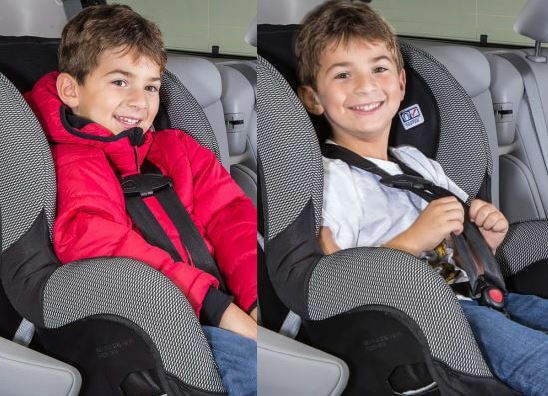 Then, remove the coat and place the child in the seat while leaving the straps at their previous settings. How well the the straps fit once the child is no longer wearing a coat? Does the fit pass the two finger test? The two-finger test is a well-known method for testing the fit of car seat straps. Place your index and middle finger under the strap just above the chest clip. If two or more fingers can fit - the harness is not tight enough. If my child can't wear a coat - how do I keep them warm? Time to get creative! It often reaches -42C with the windchill here in Ontario - so we've got to do something right? Besides moving to Aruba, think of ways you can use thin, non-compressing layers to keep the child warn as well as items that fit OVER the straps as opposed to under them. We don't want your children to be cold - but a few minutes of discomfort to keep them safe is worth it in the long run.